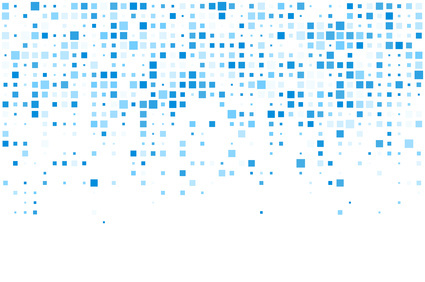 App Annie have just released their App Annie Index: 2013 Retrospective The Top Trends of 2013 and Distimo have released their monthly report, this time entitled Asia: The Leading App Market in the World. The Distimo report showed how big the Asia market is, as is apparent from the title of the report – 41% of total revenue globally came from Asia in December 2013, which makes is 32% bigger than the North American market and 78% bigger than Europe. The market in Asia is dominated by Japan, with South Korea and China next before the long tail. One thing different to North America and Europe is the parity seen by Google Play when comparing to the Apple store. 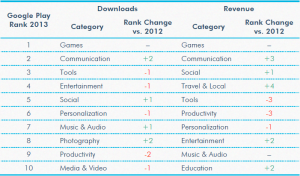 Not surprisingly the data is dominated by the games category. The markets are also dominated in the big three markets by home-grown developers, especially for non-game apps (successful games seem more universal than non-games). 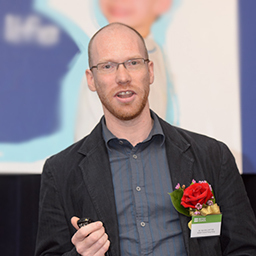 At work, this fact has been apparent for some time and has led colleagues in Japan and South Korea to publish some apps with local partners rather than through the British Council’s main account. It’s a shame Distimo did not release information on the app categories as that would be interesting to compare Asia with the rest of the world. 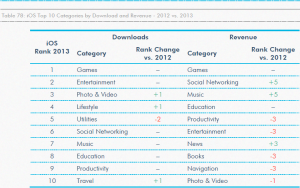 App Annie’s report is a quick glance at trends and the top charts for downloads and revenue in the top markets. There was also a focus on Asia with four of their top five markets to watch being from East Asia – Hong Kong, Indonesia, Taiwan and Thailand. We’ve certainly seen a lot of impact in those countries with LearnEnglish Grammar being massive in Thailand in particular being in the top ten downloaded educational apps last year from the Apple App Store. Part of their analysis looked at business models, showing the increase in the use if the in-app purchase (IAP) model both relative to the whole app market (93%) and in terms of growth. However, although this trend is also true of non-games apps, the difference is not so stark with only 57% of income coming from IAP for all other categories. Unsurprisingly, education doesn’t get much of a look in in these reports. 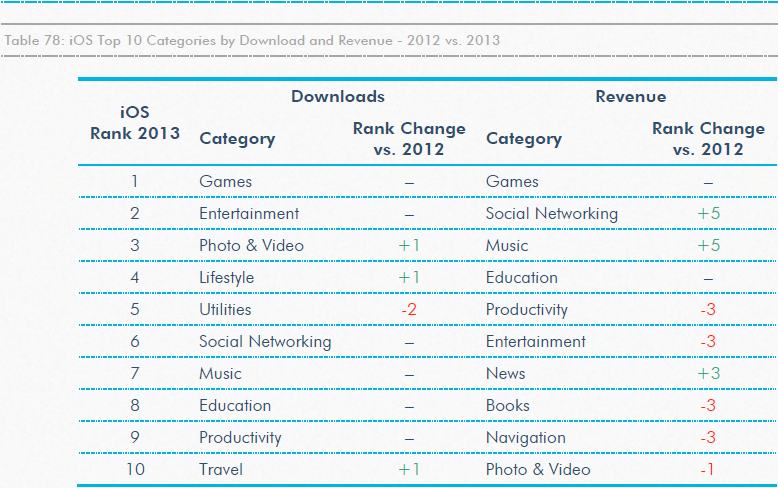 The App Annie report did list the top categories for downloads and revenues which can be seen below. Education is the 8th biggest category for downloads for iOS but continues to punch above its weight by being the #4 category in terms of revenue (both unchanged from 2012). 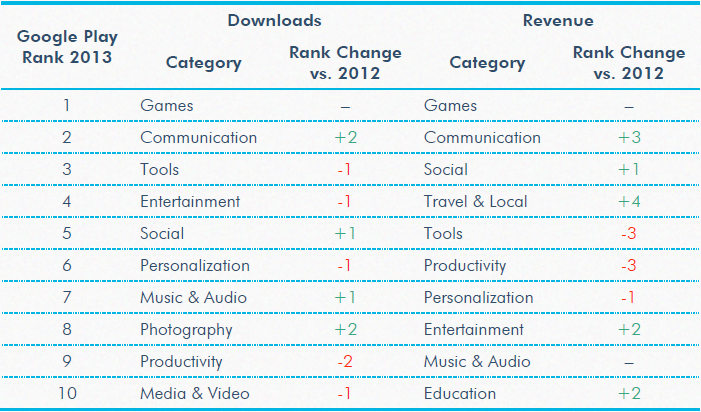 Education also creeps into the top 10 revenue generating categories for Google Play for the first time. There were also a couple of educational apps that made it into the top 10 charts published in the report by country. The Best Kids Songs app in Korea was the #4 app in terms of Revenue. Although it does not have a particular educational focus, it is published under the Education category. Magikid also do well as a publisher in China especially with their Magikid Chinese app. I like their English app too, maybe I’ll give that a proper review here sometime.